How well are schools preparing students to be effective citizens, voters, and members of their communities? This question seems more relevant than ever in the current era of contentious and polarized politics. Students recently earned national attention by organizing the March for Our Lives, a student-led demonstration against gun violence with marches occurring worldwide. This surge of political activism by young people demonstrates a high capacity for political engagement among students. Yet at the same time, real concerns persist about the extent to which schools are equipping all students with the skills they need to be effective citizens, and whether some students will leave school more prepared than others. In this context, the 2018 Brown Center Report on American Education focuses on the state of civics education in the U.S. Chapter 2 examines how states have incorporated certain practices into their requirements for civics education and uses survey data to assess whether student experiences reflect these practices. The data highlight how critical parts of a civics education, namely participatory elements and community engagement, are often missing from state requirements, whereas discussion and knowledge-building components appear more common. What constitutes a high-quality civics education? As with almost any attempt to identify a set of “best” practices in education, we find different perspectives from different experts, with a research base too thin to offer unambiguous guidance. In this context, we turn to what appears to be as close as we could reasonably expect to a consensus view from experts—the Six Proven Practices for Effective Civic Learning framework. Motivating this framework is a notion that teaching students facts about U.S. government is a goal, but not the exclusive goal, of civics education. The aim of civics education is broader and includes providing students with an understanding of how democratic processes work, as well as how to engage in these processes. A high-quality civics education thus includes opportunities for students to engage in activities within the classroom that model what democratic processes look like, as well as opportunities to participate in the civic life of their communities and learn from this participation as a formal part of their coursework. To what extent are states incorporating these practices into their civics standards and curricula? Because state policies dictate the knowledge and skills schools are required to teach their students, we created a 50-state inventory that examines whether states have adopted a subset of the PPs in their high school course graduation requirements, state standards, and curricula. We do not expect each of the 10 PPs to show up in these documents. For example, it is unlikely that states discuss extracurricular activities in their standards. Therefore, we focus on the practices most likely to be mentioned in graduation requirements, standards, and curricula: classroom instruction (PP 1), discussion of current events (PP 2), service learning (PP 3), simulations of democratic processes and procedures (PP 6), and news media literacy (PP 7). Some states might have adopted rigorous civics standards in ways that escaped our view because their language does not align with the language of the PPs. This could be true, for example, of states that have used the College, Career, and Civic Life (C3) Framework for Social Studies State Standards in designing their standards or curricula. Similar to the PPs, the C3 framework emphasizes both knowledge acquisition and active participation in civic life. Therefore, in our state inventory we also note whether or not a state has adopted the C3 framework. Of the PPs we examined, we found that the most common practices are classroom instruction, knowledge building, and discussion-based activities. These are far more common than participatory elements of learning or community engagement. For example, every state mentions discussion of current events in its standards or curriculum frameworks, and 42 states and Washington, D.C., require at least one course related to civics education. In contrast, just over half of states (26, plus Washington, D.C.) mention simulations of democratic processes or procedures, while only 11 states include service learning (a less strict definition of service learning brings this total to 20). The lack of participatory elements of learning in state accountability frameworks highlights a void in civics education, as experts indicate that a high-quality civics education is incomplete without teaching students what civic participation looks like in practice, and how citizens can engage in their communities. In addition to this analysis of state policy, we explore an important aspect of civics education: the student experience. 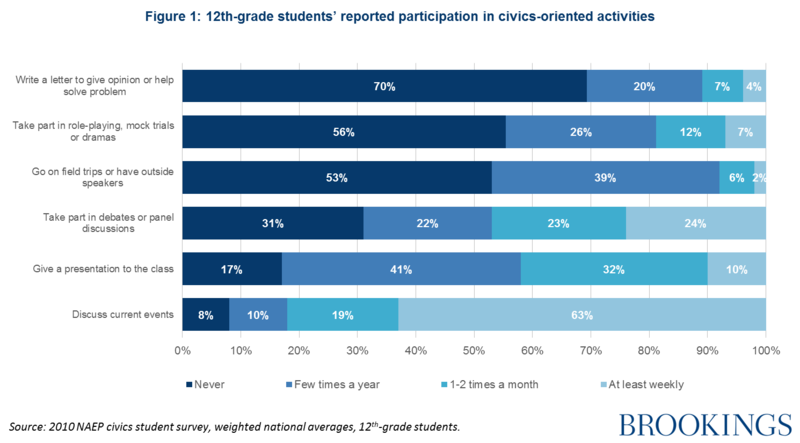 Using data from the nationally representative 2010 National Assessment of Educational Progress (NAEP) student survey on civics education, we look at the types of activities students report engaging in through their civics coursework. Similar to the policy inventory, students’ self-reported experiences reflect an emphasis on in-class, discussion-based civics education. Figure 1 illustrates that discussion of current events occurs regularly, whereas opportunities for community engagement and participation in simulations of democratic procedures occur considerably less frequently. Our analysis of state policy and self-reported student experiences indicates that most states do include important aspects of a quality civics education in their standards and curricula. However, there is room to grow in incorporating more participatory components of civics education into students’ experiences. Fortunately, a growing body of research on civics education and an increasing number of resources, such as the C3 framework, are available to help states and educators provide their students with a well-rounded civics experience. For more in-depth analysis of civics education, and what the education community can do to ensure that today’s students are prepared to be tomorrow’s citizens, see the 2018 Brown Center Report on American Education.